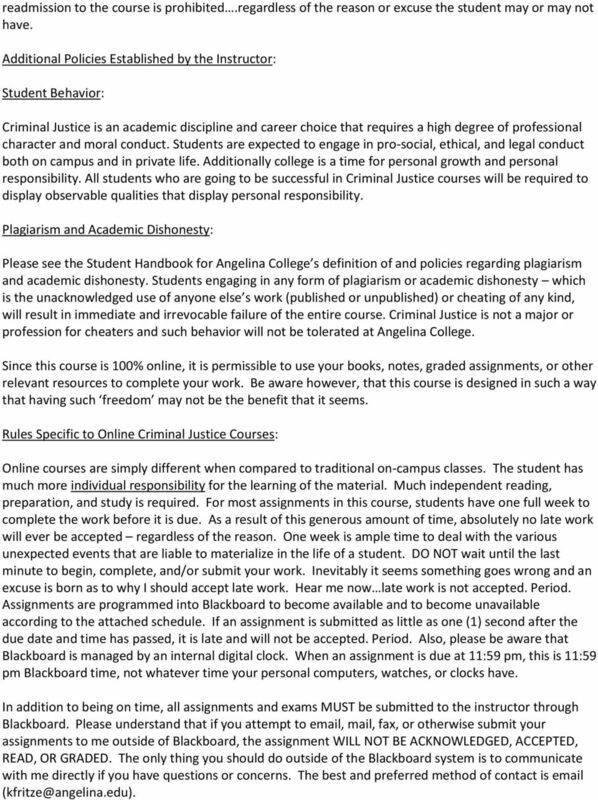 Download "Angelina College Technology & Workforce Division CRIJ 1301 - Introduction to Criminal Justice - ONLINE Summer I 2015 Course Syllabus"
1 I. 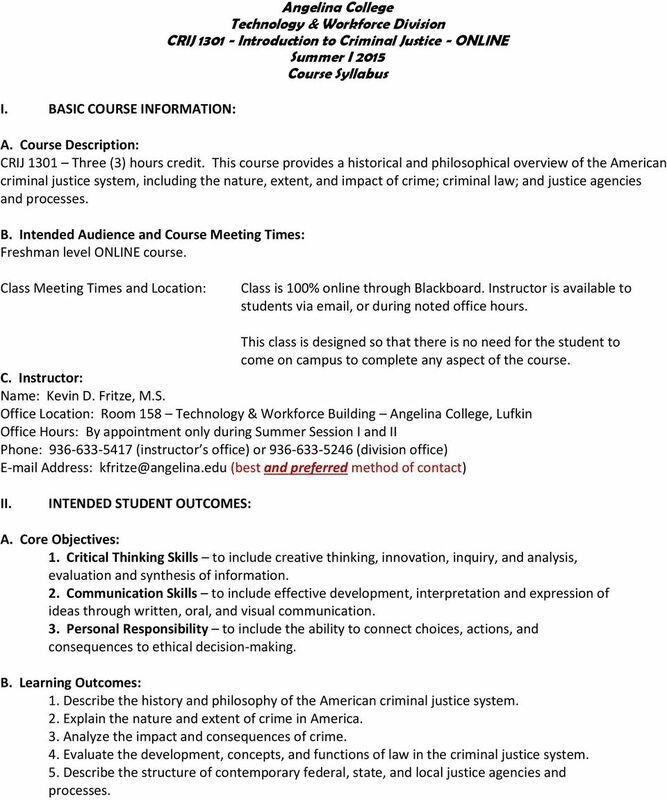 BASIC COURSE INFORMATION: Angelina College Technology & Workforce Division CRIJ Introduction to Criminal Justice - ONLINE Summer I 2015 Course Syllabus A. 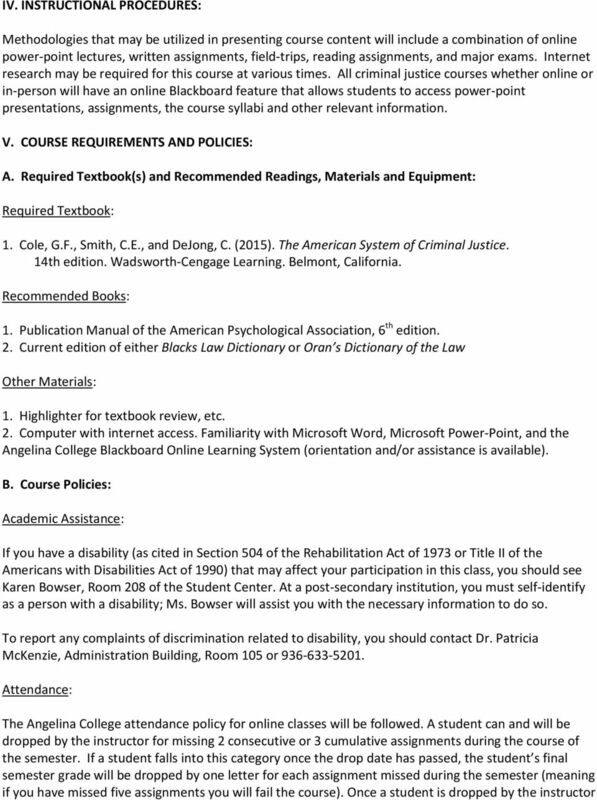 Course Description: CRIJ 1301 Three (3) hours credit. This course provides a historical and philosophical overview of the American criminal justice system, including the nature, extent, and impact of crime; criminal law; and justice agencies and processes. B. 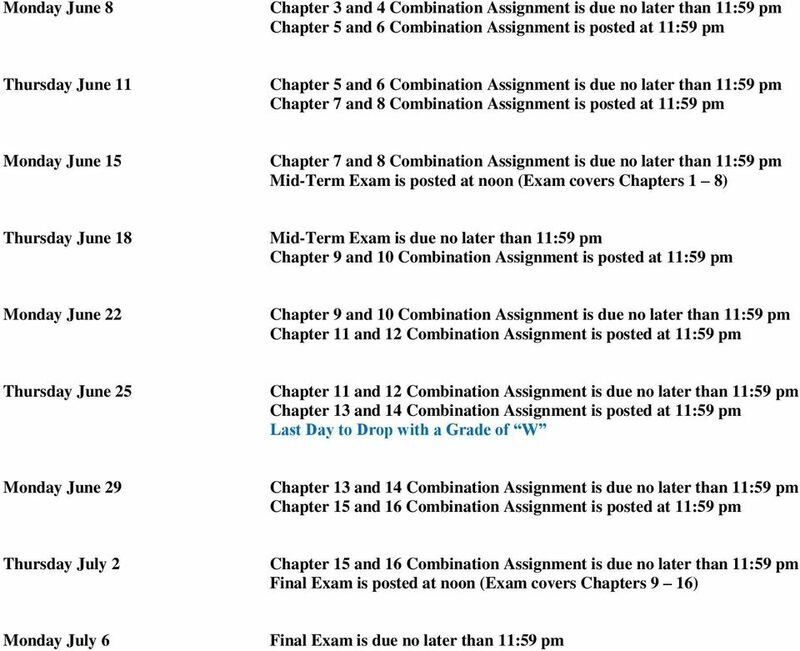 Intended Audience and Course Meeting Times: Freshman level ONLINE course. Class Meeting Times and Location: Class is 100% online through Blackboard. Instructor is available to students via , or during noted office hours. This class is designed so that there is no need for the student to come on campus to complete any aspect of the course. C. Instructor: Name: Kevin D. Fritze, M.S. Office Location: Room 158 Technology & Workforce Building Angelina College, Lufkin Office Hours: By appointment only during Summer Session I and II Phone: (instructor s office) or (division office) Address: (best and preferred method of contact) II. INTENDED STUDENT OUTCOMES: A. Core Objectives: 1. Critical Thinking Skills to include creative thinking, innovation, inquiry, and analysis, evaluation and synthesis of information. 2. Communication Skills to include effective development, interpretation and expression of ideas through written, oral, and visual communication. 3. Personal Responsibility to include the ability to connect choices, actions, and consequences to ethical decision-making. B. Learning Outcomes: 1. Describe the history and philosophy of the American criminal justice system. 2. Explain the nature and extent of crime in America. 3. Analyze the impact and consequences of crime. 4. Evaluate the development, concepts, and functions of law in the criminal justice system. 5. Describe the structure of contemporary federal, state, and local justice agencies and processes. 2 III. ASSESSMENT MEASURES A. Assessments for the Core Objectives (Tentative) 1. Critical Thinking: Students will engage in assigned readings and will be presented with oral and visual lecture content. The student will be able to demonstrate the ability to think creatively, to innovate, inquire, analyze, evaluate and synthesize information. Students will correctly answer embedded exam questions testing their knowledge, interpretation, and synthesis of comparative theories, current research, and social issues. 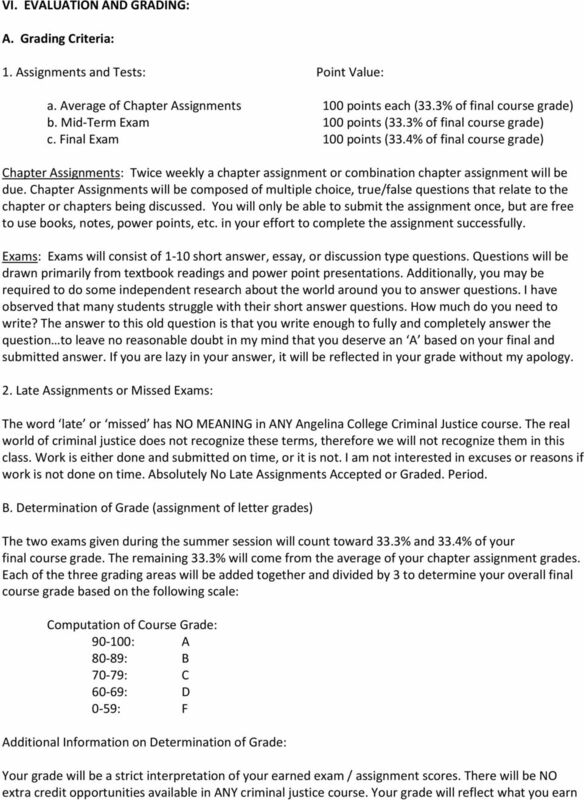 Outcome will be assessed using a rubric which incorporates the Angelina College Institutional Rubric for Critical Thinking Skills. 2. Communication: Students will research an assigned topic and will write an essay on the assigned topic. Students will present their findings to the class as a whole via an oral presentation. 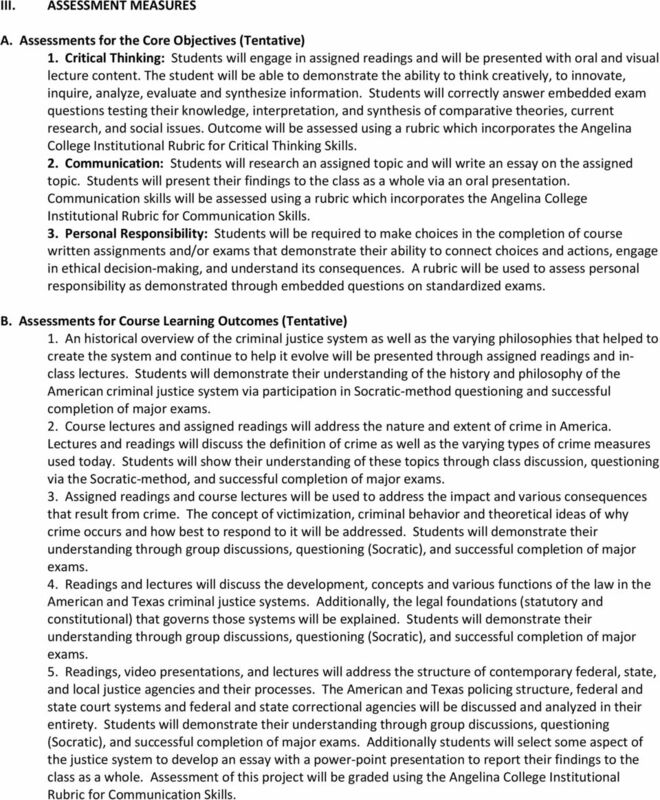 Communication skills will be assessed using a rubric which incorporates the Angelina College Institutional Rubric for Communication Skills. 3. Personal Responsibility: Students will be required to make choices in the completion of course written assignments and/or exams that demonstrate their ability to connect choices and actions, engage in ethical decision-making, and understand its consequences. A rubric will be used to assess personal responsibility as demonstrated through embedded questions on standardized exams. B. Assessments for Course Learning Outcomes (Tentative) 1. An historical overview of the criminal justice system as well as the varying philosophies that helped to create the system and continue to help it evolve will be presented through assigned readings and inclass lectures. Students will demonstrate their understanding of the history and philosophy of the American criminal justice system via participation in Socratic-method questioning and successful completion of major exams. 2. Course lectures and assigned readings will address the nature and extent of crime in America. Lectures and readings will discuss the definition of crime as well as the varying types of crime measures used today. Students will show their understanding of these topics through class discussion, questioning via the Socratic-method, and successful completion of major exams. 3. Assigned readings and course lectures will be used to address the impact and various consequences that result from crime. The concept of victimization, criminal behavior and theoretical ideas of why crime occurs and how best to respond to it will be addressed. Students will demonstrate their understanding through group discussions, questioning (Socratic), and successful completion of major exams. 4. Readings and lectures will discuss the development, concepts and various functions of the law in the American and Texas criminal justice systems. Additionally, the legal foundations (statutory and constitutional) that governs those systems will be explained. Students will demonstrate their understanding through group discussions, questioning (Socratic), and successful completion of major exams. 5. Readings, video presentations, and lectures will address the structure of contemporary federal, state, and local justice agencies and their processes. The American and Texas policing structure, federal and state court systems and federal and state correctional agencies will be discussed and analyzed in their entirety. Students will demonstrate their understanding through group discussions, questioning (Socratic), and successful completion of major exams. Additionally students will select some aspect of the justice system to develop an essay with a power-point presentation to report their findings to the class as a whole. Assessment of this project will be graded using the Angelina College Institutional Rubric for Communication Skills. 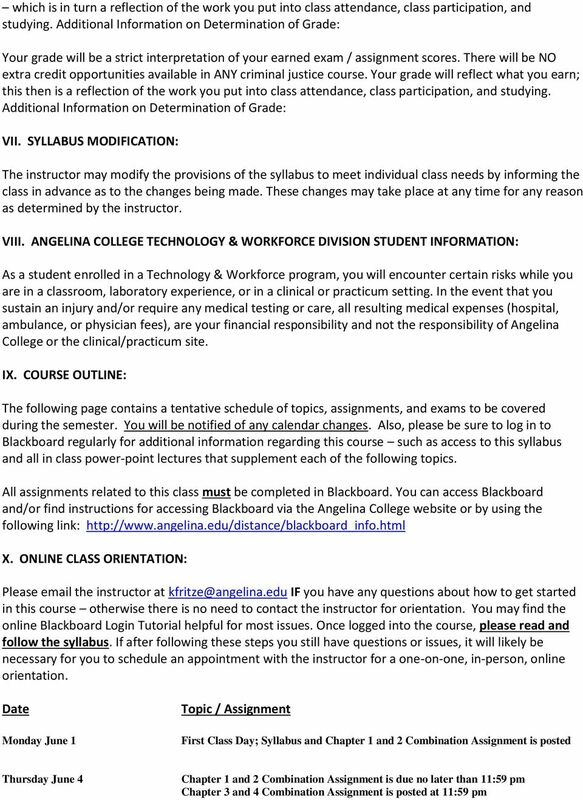 Angelina College Science and Mathematics Division Biology 2401 Anatomy and Physiology I (Wednesday Hybrid) Tentative Instructional Syllabus I. BASIC COURSE INFORMATION A. Course Description Biology 2401. Criminal Justice Management 3020-01 CRN 31290 Course Syllabus Fall 2015 3 Credit Hours Course Meets: T/TH 1300-1420 August 24 th -December 4th Classroom: GCB 405 Office Hours: 0800-1000 M, T, W, R, F.
Required Text Schacter, Daniel L. Introducing Psychology with Updates on DSM-5 (2nd ed.). Worth Publishers. (2014). Office Hours: Mondays [12-1] & [3-4], Tuesdays [12-1], Wednesdays [12-1] & [3-4]. Or by appointment by email/phone.